Skip the Chinese food take-out! 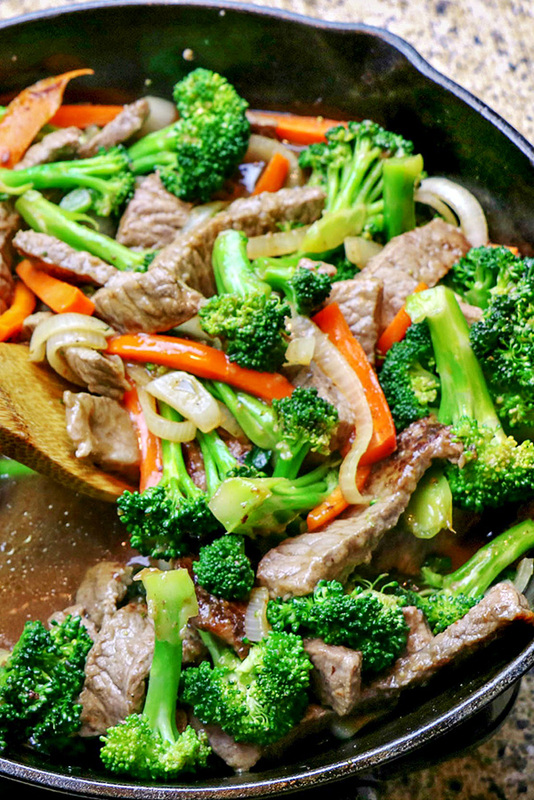 You can make this delicious and easy Beef and Broccoli Stir Fry Recipe at home in about 30 minutes. This Beef and Broccoli Stir Fry recipe is one of the easiest Chinese takeout foods you can make. If you can cut vegetables and steak, you can make this recipe! Before you start cooking, you’ll need to cut your veggies: the broccoli is cut into florets, the onion is cut in half and sliced, and the carrots are cut into thin sticks. 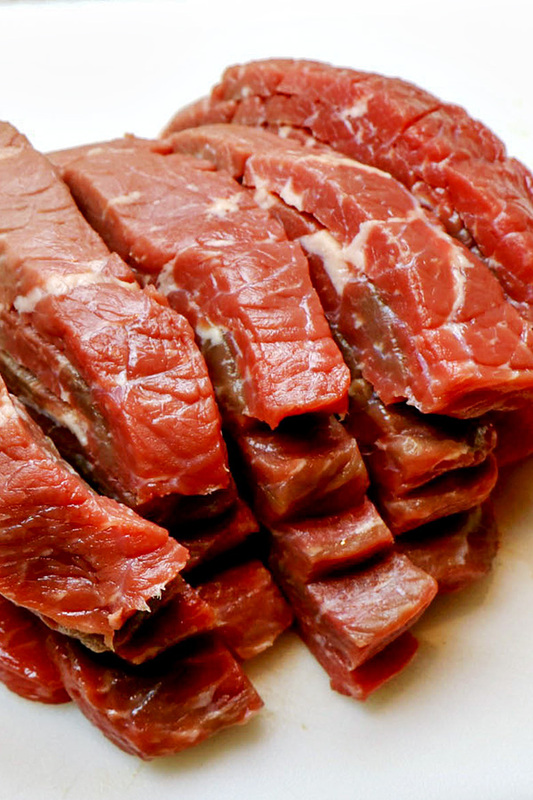 You’ll also need to prepare your round steak by cutting it into thin strips. 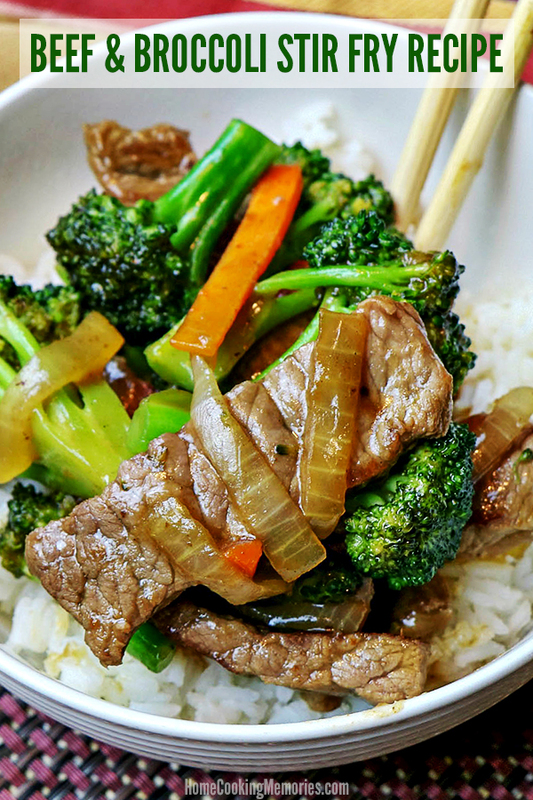 To start cooking your Beef and Broccoli Stir Fry recipe, in a small bowl, you’ll combine cornstarch, water, and garlic powder to make a smooth coating for the beef strips. You’ll coat the beef strips with this mixture and then cook them in a large skillet over medium-high heat, about 2-3 minutes per side. 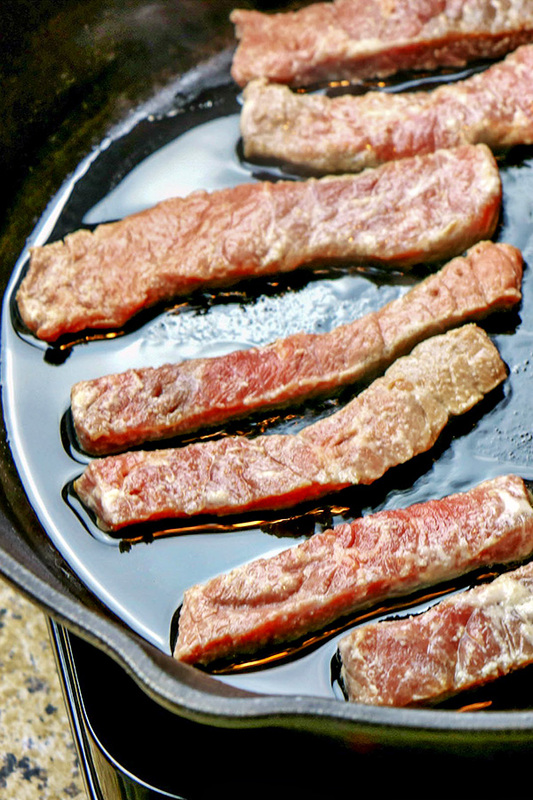 Once the beef strips are done, remove them from the skillet and set aside. Next, you’ll get your sauce ready. In a small bowl, combine ingredients for the sauce: soy sauce, ginger, brown sugar, the remaining cornstarch, and water. Set aside the sauce aside while you get your vegetables started. 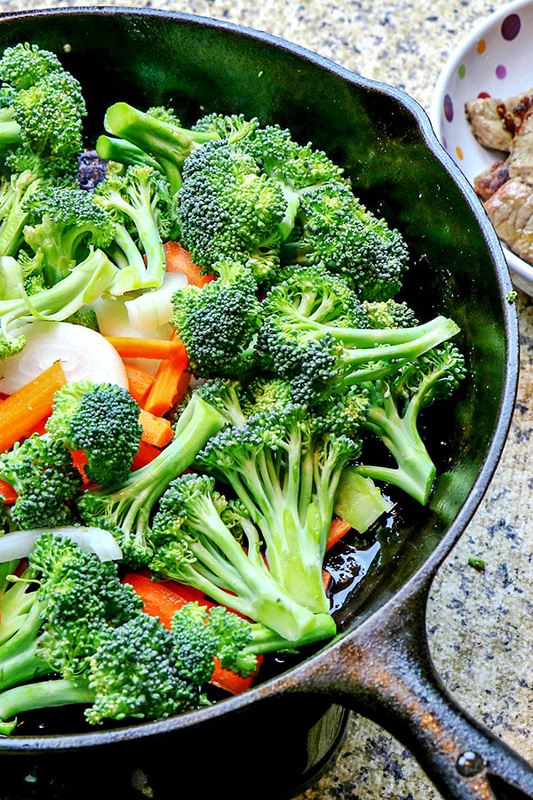 Place the broccoli, onion, carrots, and a bit of water to the skillet. Cook the vegetables over medium heat and stirring occasionally until crisp-tender. Add the beef back to skillet with vegetables and pour the sauce mixture over the meat and vegetables. Continue to cook and stir over medium heat until sauce thickens. Once the sauce is thickened, it’s ready to serve! 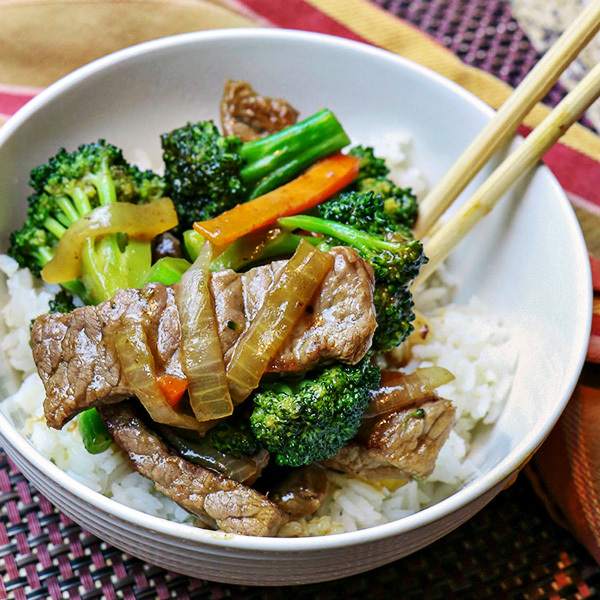 Watch our video to see this Beef and Broccoli Stir Fry recipe being made! We recommend serving with white rice or fried rice. Here is the full recipe, ready for you to print! If you like this recipe, we’d love for you to share it on Facebook or pin it on Pinterest. In a small bowl, combine 2 tablespoons cornstarch, 2 tablespoons water, and garlic powder. Stir until smooth. Pour cornstarch mix over beef strips and toss, coating well. Heat a large skillet or wok over medium-high heat. Drizzle with oil. Add beef in small batches, cooking on each side for approximately 2-3 minutes or until it reaches desired doneness. Remove and keep beef warm. Combine soy sauce, ginger, brown sugar, remaining cornstarch, and ½ cup water in a small bowl. Stir until smooth. Set aside. Add broccoli, onion, and carrots to the skillet. Pour remaining water over vegetables and cover, cooking at medium heat and stirring occasionally until crisp-tender. Add beef back to skillet with vegetables. Pour soy sauce mixture over the meat and vegetables. Cook and stir over medium heat until sauce thickens, about 2 minutes. This is a great stir fry that we will really enjoy, it sure looks good! Hope you are having a great week and staying warm. Thanks so much for sharing with us at Full Plate Thursday and come back soon! I looove beef and broccoli! Most nights we end up having stir fry for dinner because it’s just so easy. I’ll have to try your recipe 😉 Happy Fiesta Friday!! I haven’t had beef broccoli in a while and this got me craving. – looks super delish! Thanks for sharing at Fiesta Friday party! This looks delicious. We order this in restaurants so I need to learn to make it at home. 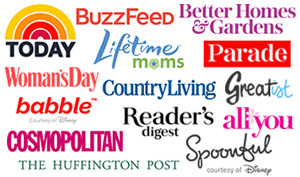 Your recipes sounds scrumptious. Pinned. Thanks for sharing with us at Merry Monday. See ya next week.